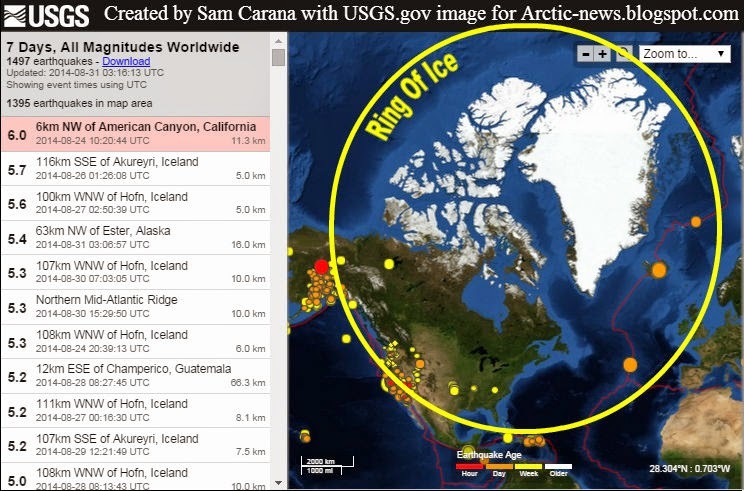 Prominence of earthquakes in North America and around Greenland has prompted a team of researchers led by Arctic-news blog editor Sam Carana to coin the phrase “Ring Of Ice” to describe what they see happening in the Arctic. “Melting of ice in north Canada and on Greenland is causing pressure changes, resulting in seismic activity”, explains Sam Carana. Heavy seismic activity is ocurring along the faultlines that constitute the border of the North American Plate, similar to the the heavy activity along the Ring Of Fire around the Pacific Ocean. Seismic activity roughly follows the borders of the North American Plate, which includes Greenland. 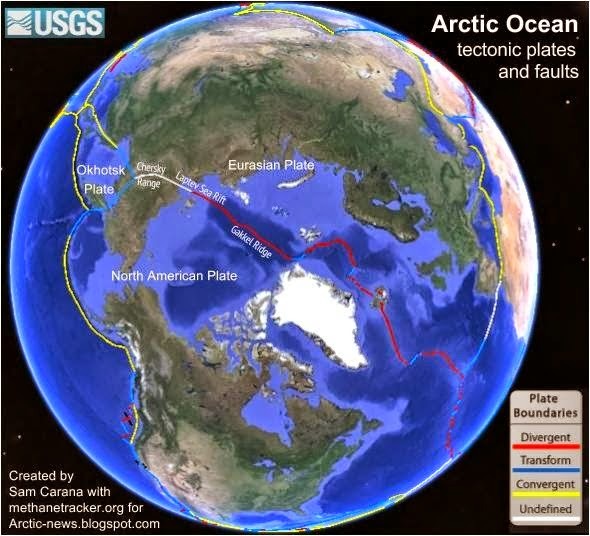 However, where the major fault bends away to the west following the Aleutian Islands, seismic activity continues north through Alaska along a line that extends over the North Pole toward Svalbard. 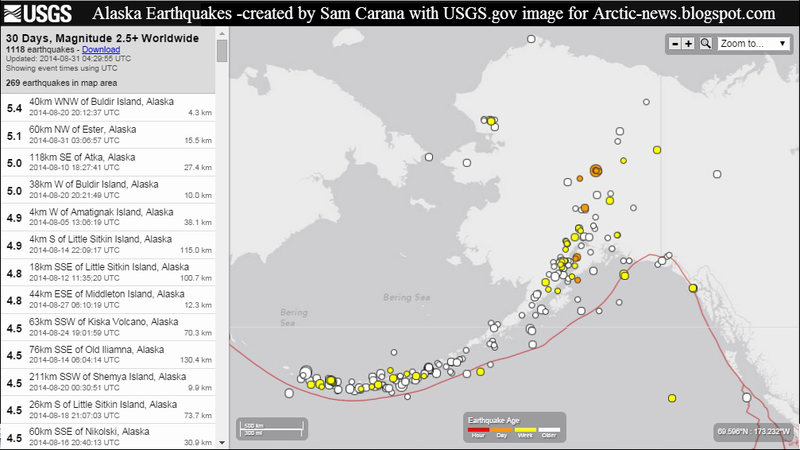 This northward path through Alaska is illustrated by the earthquakes on the image below. 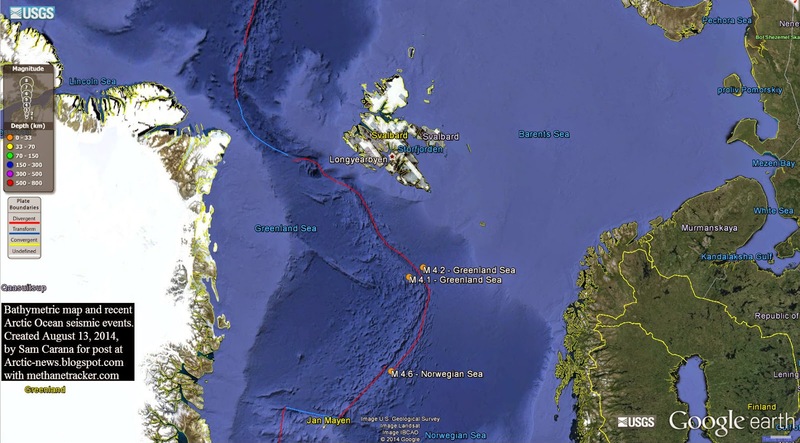 “Earthquakes are prominent along the entire border of the North American Plate”, Sam Carana adds, “but they increasingly appear to be taking this shortcut through Alaska and the underlying cause of this is melting of ice in north Canada and on Greenland”. 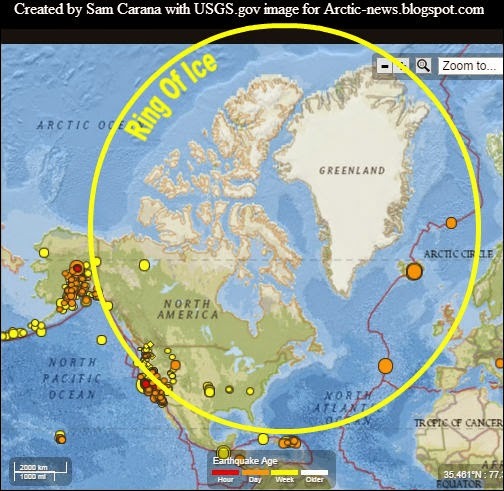 “This Ring Of Ice spells danger, just like the name Ring Of Fire indicates danger”, Sam Carana concludes. “The name Ring Of Fire warns about possible volcanoes, earthquakes, landslides and tsunamis. The Ring Of Ice seems even more dangerous, since seismic activity could destabilize methane hydrates contained in sediments under the Arctic Ocean, and could trigger huge methane eruptions. The fault line running from Greenland to Siberia is the most dangerous area on Earth in that respect”. are separated by rapid warming from 1976-1999.
to the average, in the north Atlantic Ocean. to coincide with more ocean heat storage. A new study looks at how, in the 21st century, surface warming slowed as more heat moved deeper into the oceans, specifically the North Atlantic. 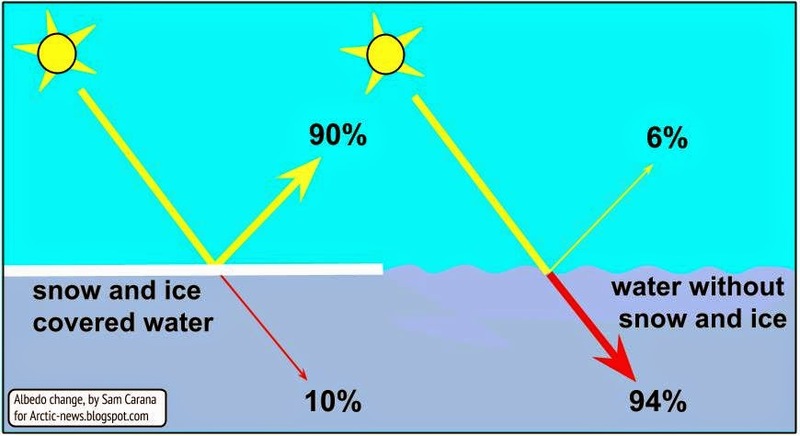 Sun-warmed salty water travels north along ocean currents in the Atlantic. When this saltier water reaches the North Atlantic, its greater density causes it to sink. From about 1999, this current began to speed up and draw heat deeper into the ocean. 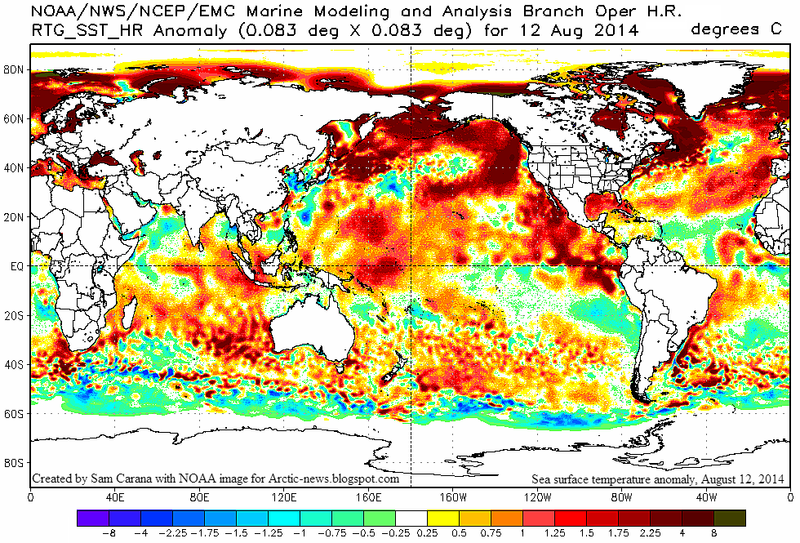 These huge amounts of heat moving deeper into the Atlantic Ocean are very worrying. 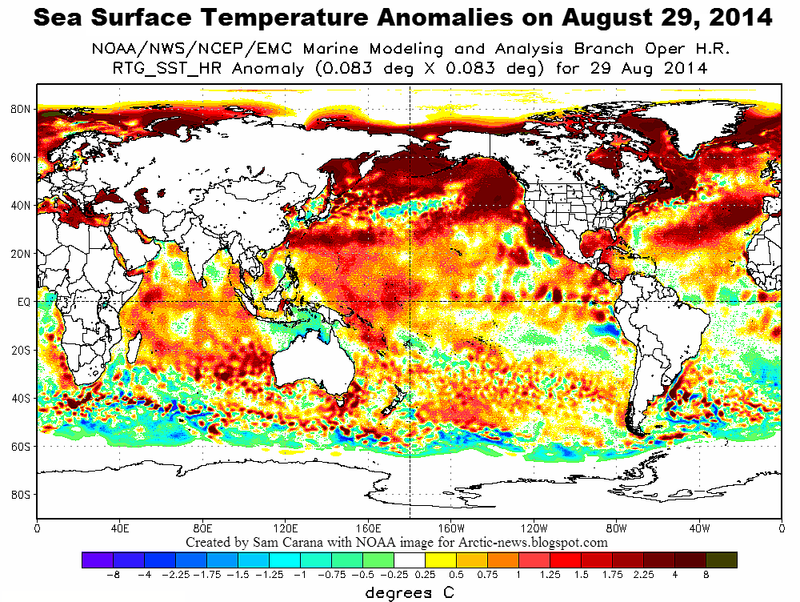 The image below shows that sea surface temperatures have reached extremely high levels on the Northern Hemisphere, where sea surface temperature anomalies as high as 1.78 degrees Celsius were recorded on August 19, 2014. As discussed in an earlier post, water carried by the Gulf Stream below the surface can be even warmer than surface waters. 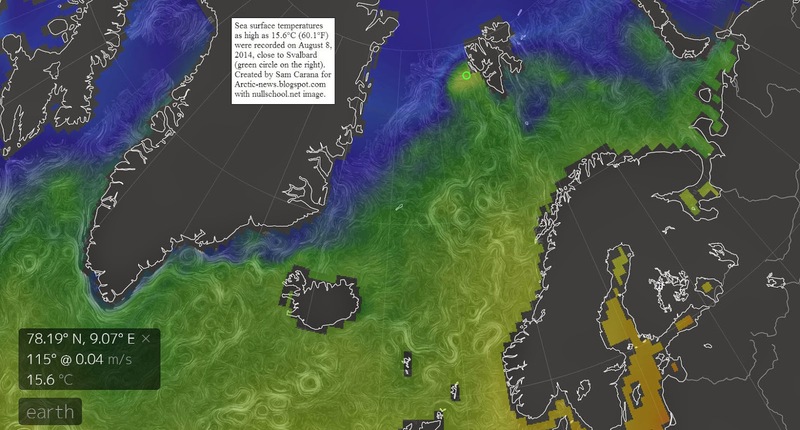 As the post discusses, high sea surface temperatures west of Svalbard indicate that the Gulf Stream can carry very warm water (warmer than 16°C) at greater depths and is pushing this underneath the sea ice north of Svalbard. Similarly, warm water from greater depth comes to the surface where the Gulf Stream pushes it against the west coast of Novaya Zemlya. 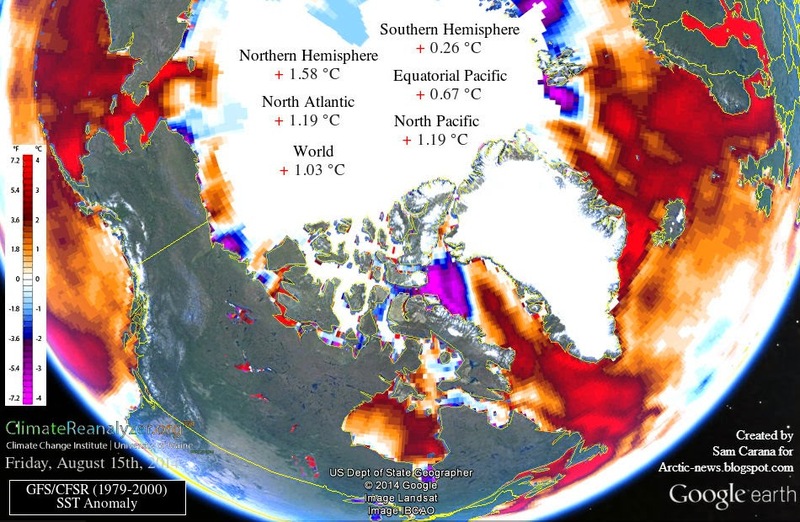 Very warm water is now invading the Arctic Ocean through the Bering Strait from the Pacific Ocean, while very warm water is also traveling on the back of the Gulf Stream from the North Atlantic into the Arctic Ocean. The danger is that this warm water will destabilize hydrates contained in sediments under the Arctic Ocean and trigger huge methane eruptions. Rising methane levels over the past few years are ominous in this respect. 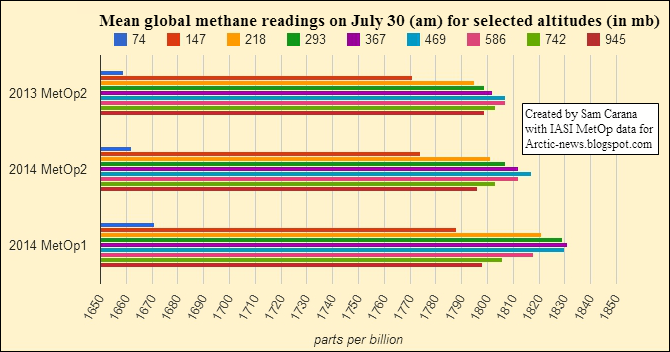 The image below shows very high mean global methane levels on August 28, 2014, while methane readings as high as 2561 ppb were recorded on that day. by Xianyao Chen and Ka-Kit Tung. For anyone attending the September 23, 2014, Climate Summit in New York, it is important to bring the message that, while Congress may seek to deny the physical and legal realities, President Obama can and should act on climate change. 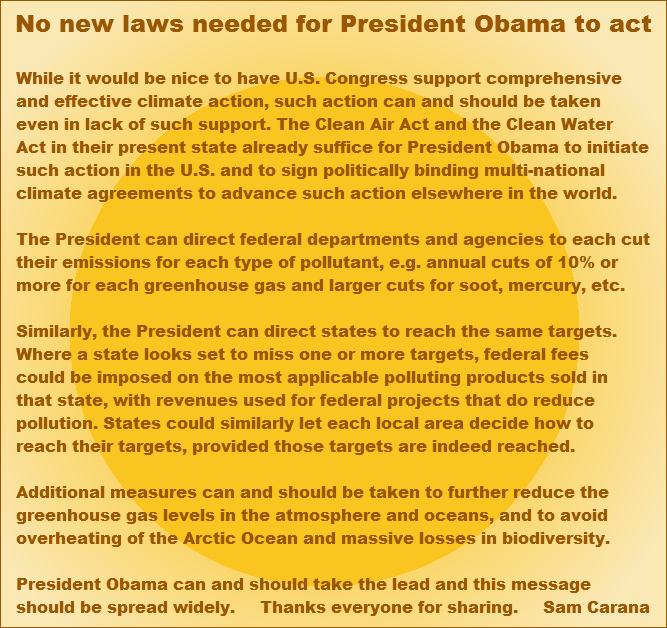 As you know, Sam Carana advocates comprehensive and effective action as discussed at the Climate Plan blog. You can share the message on facebook by clicking on the image below. 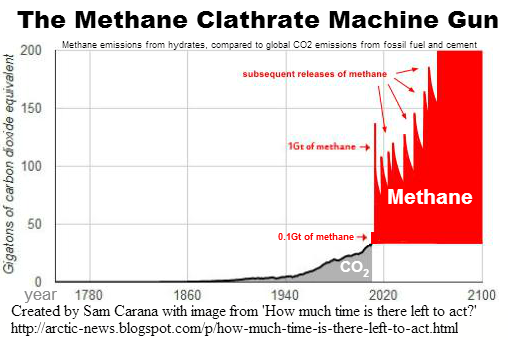 Global mean methane levels as high as 1836 parts per billion were recorded at several altitudes on August 24, 2014. 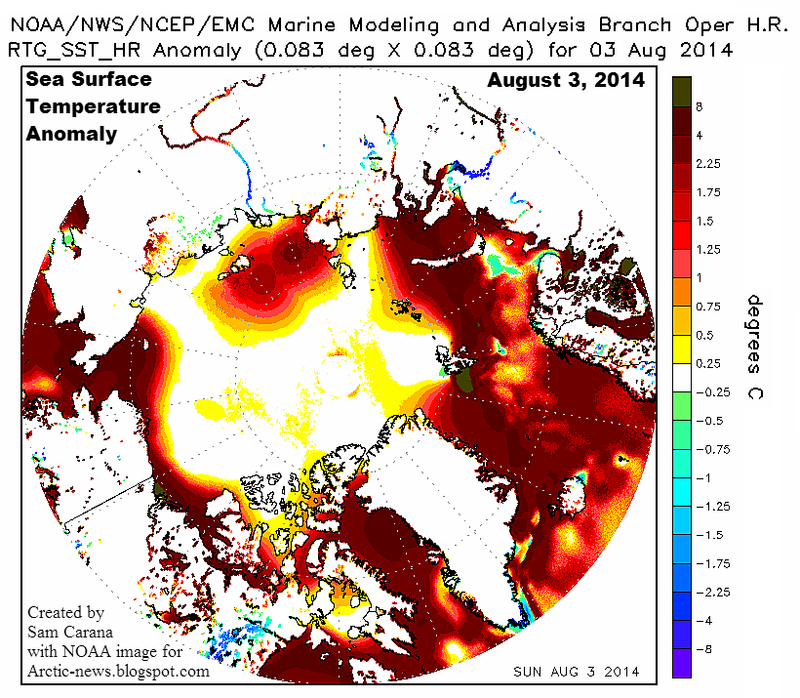 Meanwhile, the Arctic Ocean continues to warm up. 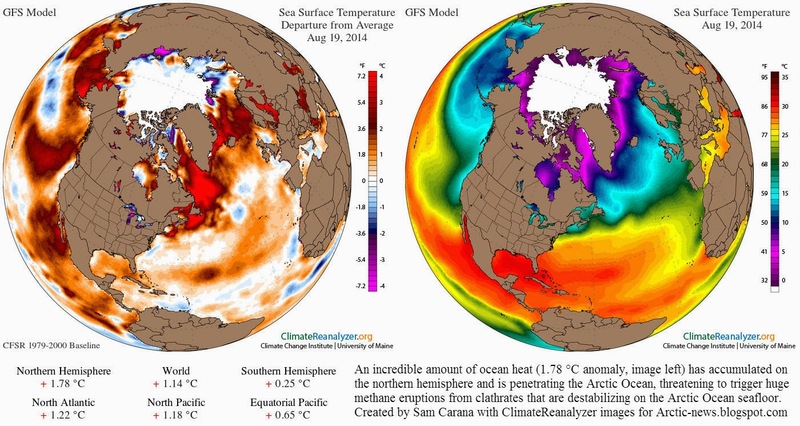 As the image below shows, the ocean heat is felt strongly on the Northern Hemisphere. 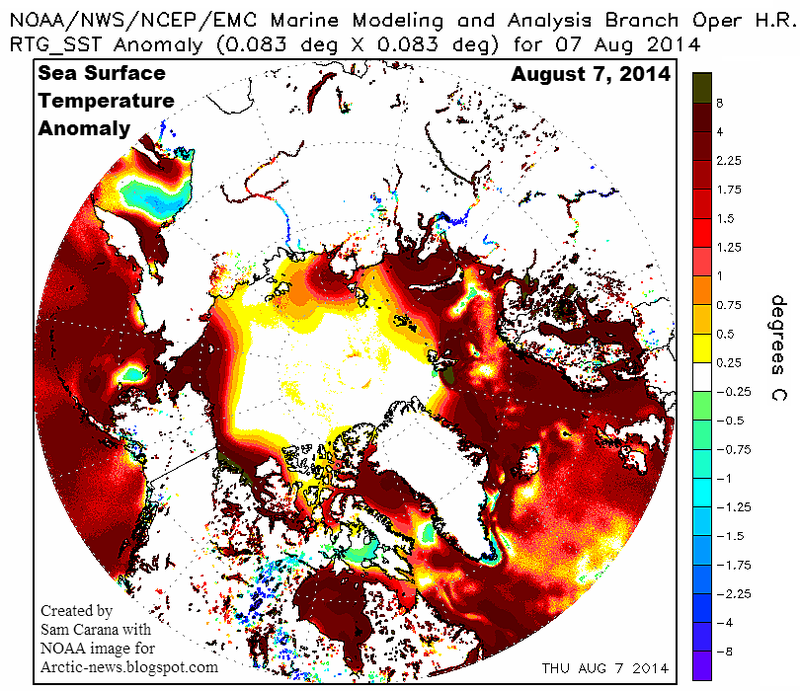 Very warm waters from the North Pacific and the North Atlantic Oceans are now invading the Arctic Ocean. Never before in human history have these waters been this warm. 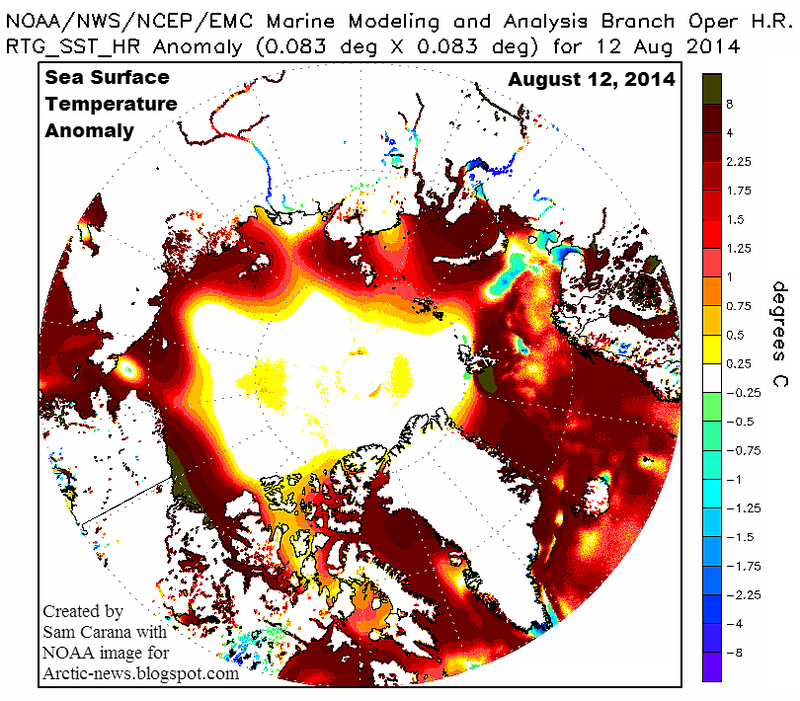 In the Arctic Ocean, this is causing very high sea surface temperatures, as shown on the image below. The very high temperatures threaten to trigger all kinds of feedbacks, as described in the image below. 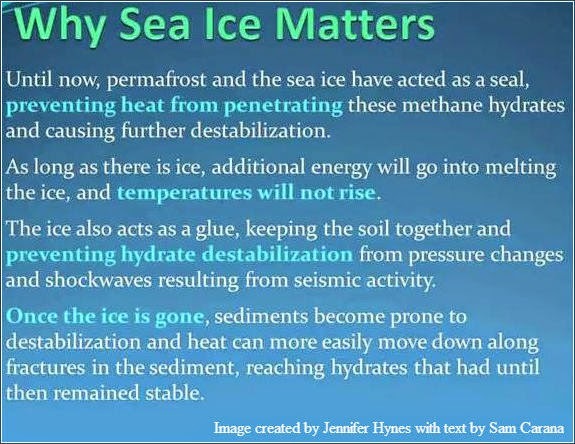 The big danger is that, as the seabed warms up, methane will erupt from hydrates in sediments under the Arctic Ocean. The situation is dire and calls for comprehensiev and effective action, as discussed at the Climate Plan blog. High methane concentrations have been showing up over Beaufort Sea over the past few days, as shown on the image below. This follows the recent high methane concentrations over the East Siberian Sea. 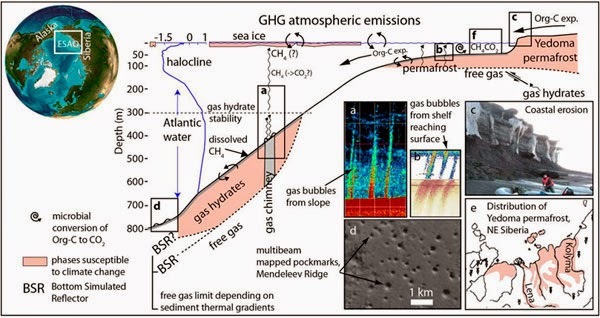 The persistent character of these very high methane concentrations over the Arctic Ocean indicates that methane has started to erupt from clathrates under the seabed, triggered by very warm water reaching the bottom of the Arctic Ocean. Methane eruptions from hydrates in sediments under the Arctic Ocean helped mean methane levels reach new records, with mean global methane readings as high as 1835 parts per billion recorded at several altitudes on August 17, 2014. 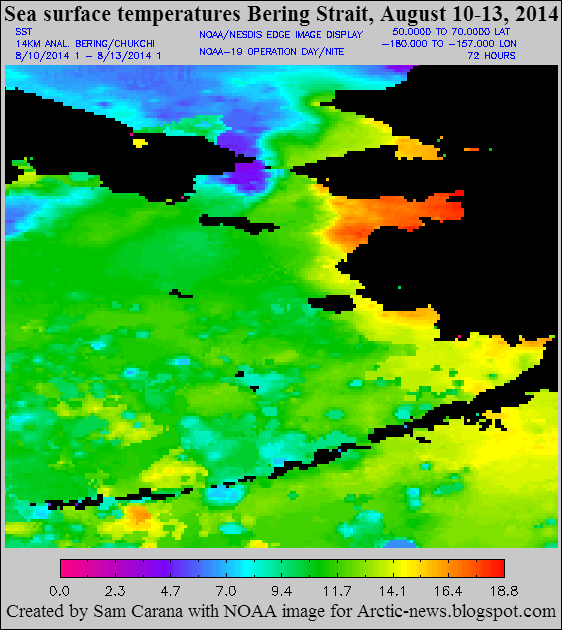 The very high sea surface temperature anomalies that show up on above image give an idea of the inflow of warm water from the Pacific Ocean through the Bering Strait. This is further highlighted by the combination image below. 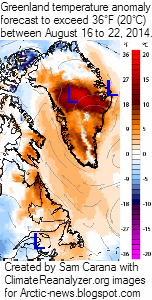 A heatwave with temperature anomalies exceeding 36°F (20°C) is expected to hit Greenland between August 16 and 22, 2014, as illustrated by the image on the left and the animation on the right. Such heatwaves can be expected to hit the Arctic more frequently and with greater intensity, as temperatures in the Arctic are rising faster than elsewhere on Earth. Such heatwaves can result in massive melting on Greenland, as persistent heat changes the texture of the snow and ice cover, in turn reducing its reflectivity. This makes that less sunlight is reflected back into space and is instead absorbed. The image below illustrates what a difference the presence of sea ice can make. As the NSIDC/NOAA graphs below shows, melting on Greenland has been relatively modest this year when compared to the situation in 2012. By July 12, 2012, 97% of the ice sheet surface had thawed, according to this NASA analysis and this NOAA Arctic Report Card. Melting on Greenland directly affects sea level rise, and melting on Greenland is accelerating due to a number of factors. Projections of melting on Greenland have long been based on a warming atmosphere only, ignoring the warmer waters that lubricate glaciers and that warm Greenland's bedrock canyons that sit well below sea level. Furthermore, there are growing quantities of black carbon deposits as a result of burning of fossil fuel and biomass. High temperatures have recently caused ferocious wildfires in Canada that have in turn caused a lot of black carbon to go up high into the atmosphere. And of course, the atmosphere over the Arctic is warming up much faster than most models had projected. This in turn causes triggers further feebacks, including more extreme weather events such as heatwaves and rain storms that can be expected to hit Greenland with ever more frequency and ferocity. 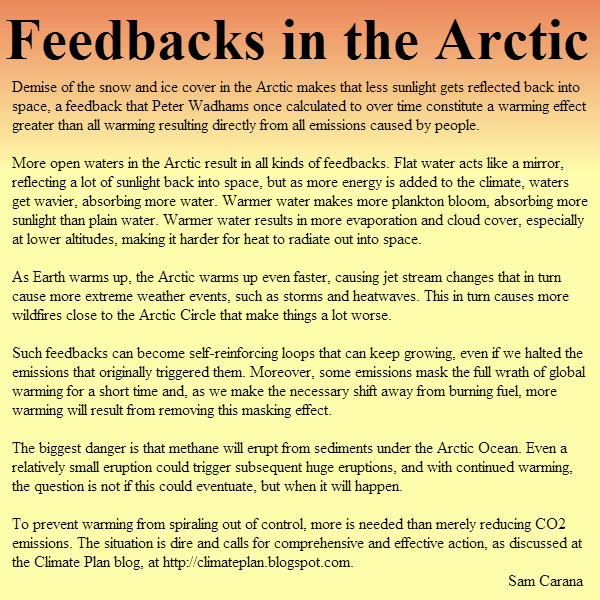 Further feedbacks include methane eruptions from the heights of Greenland, as discussed at the Arctic Feedbacks Page. When also taking into account the accelerating impact of such factors on melting in Greenland, sea levels could rise much faster than anticipated, as illustrated by the image below. 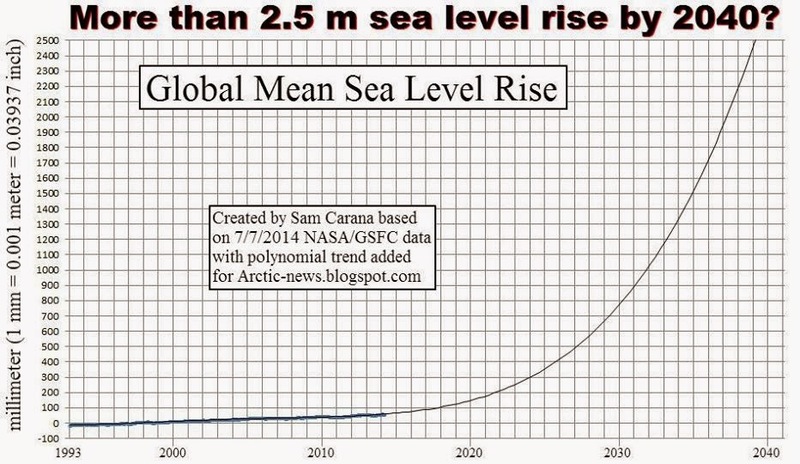 from: more than 2.5m sea level rise by 2040? Note that sea level rise is only one of the many dangers of global warming, as discussed in the 2007 post Ten Dangers of Global Warming. 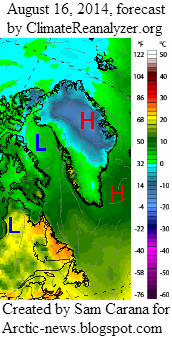 The image on the right shows a temperature forecast for August 16, 2014, with parts of Greenland changing in color from blue into green, i.e. above the melting point for snow and ice. Such high temperatures are now hitting locations close to the North Pole ever more frequently, due to the many feedbacks that are accelerating warming in the Arctic, as discussed at this Feedbacks page. One of the most dangerous feedbacks is a sudden eruption of huge quantities of methane from the seafloor of the Arctic Ocean, as discussed in a recent post. The impact of such feedbacks can be accumulative and interactive, resulting in self-reinforcing feedbacks loops that can escalate into runaway warming. Below is another forecast by ClimateReanalyzer for August 16, 2014, showing the remarkable ‘greening’ of Greenland, as well as the very high temperatures reaching the higher latitudes of North America. Also see the very high sea surface temperatures around Greenland on the image below, created with ClimateReanalyzer. 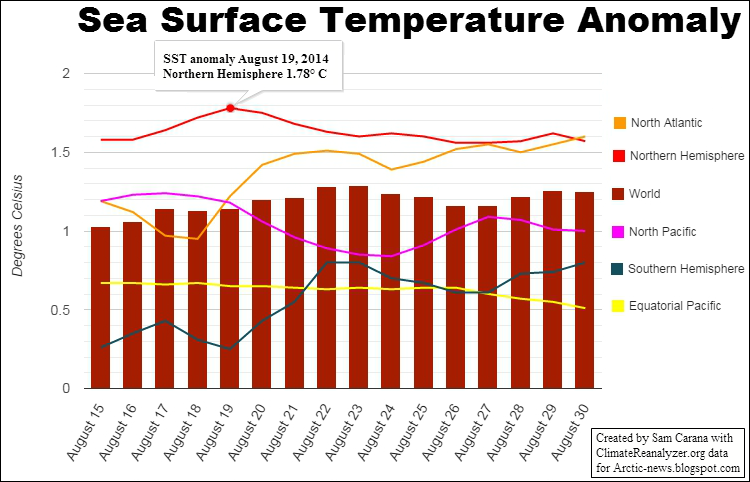 Sea surface temperature anomalies on August 15, 2014. Researcher Jennifer Hynes recently gave a frightening presentation about the situation in the Arctic and the odds that things will rapidly spiral out of control soon, escalating into runaway global warming a few decades from now. Above, a slide from the presentation, warning about the danger of earthquakes causing methane hydrate destabilization (from: Smoke Blankets North America). 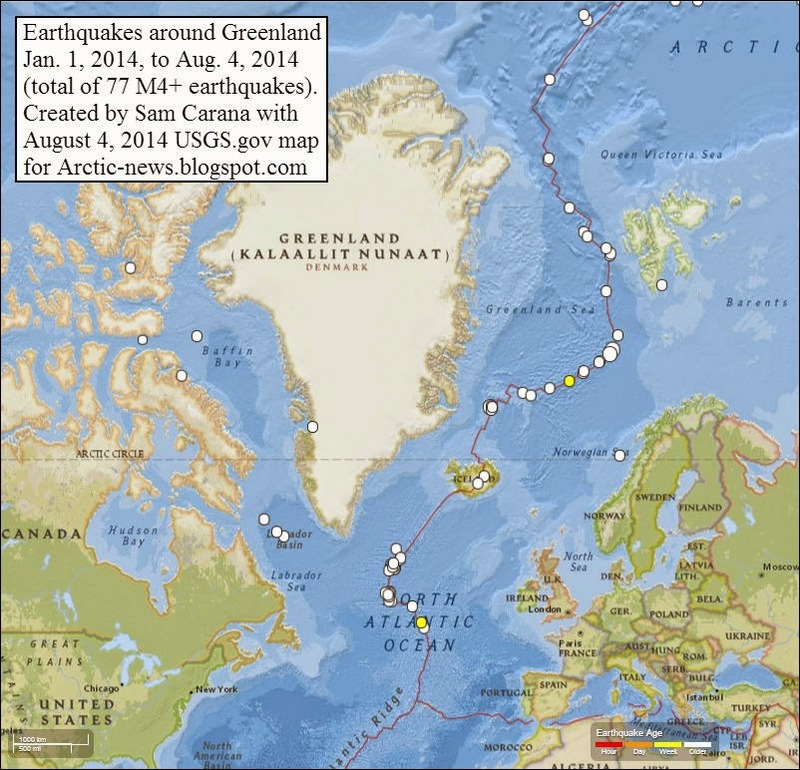 As the map below shows, 77 M4+ earthquakes did hit locations around Greenland in the year 2014 up until August 4. 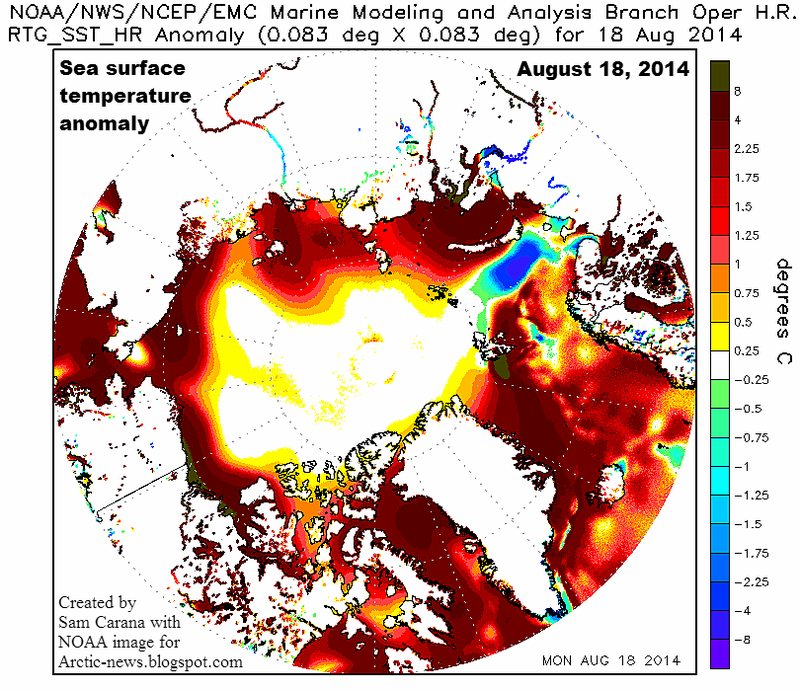 The image below shows sea surface temperature anomalies in the Arctic at August 7, 2014. Warm water is carried into the Arctic Ocean by the Gulf Stream, as illustrated by the image below. 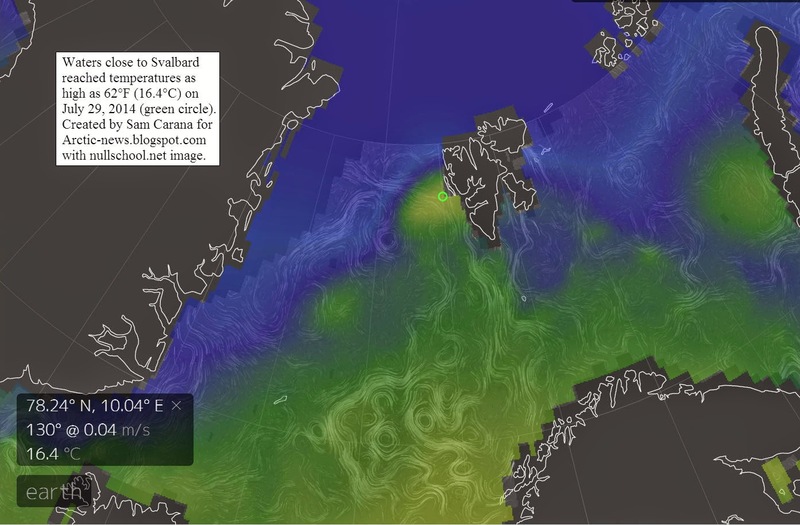 The image shows how the Gulf Stream brings warm water to the edge of the sea ice. 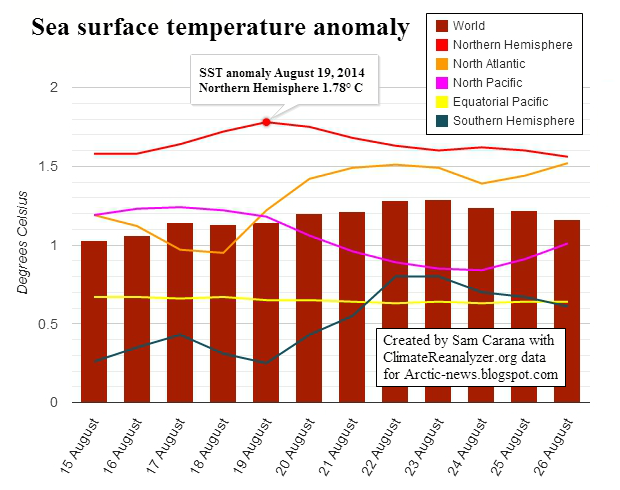 Waters close to Svalbard reached temperatures as high as 15.6°C (60.1°F) on August 8, 2014 (green circle). 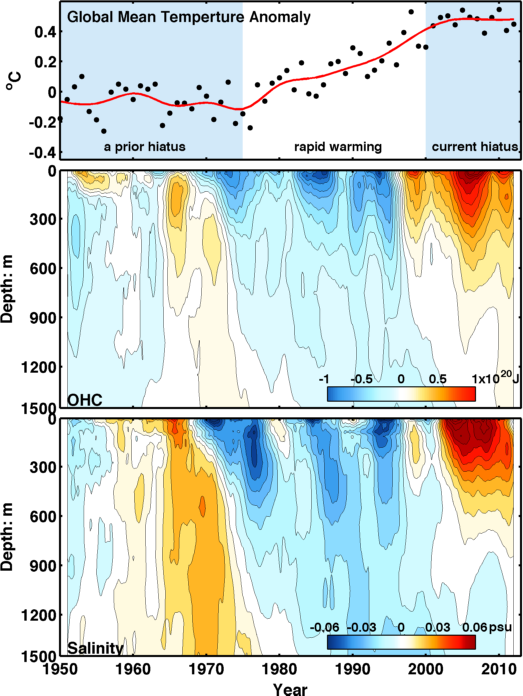 Note that what the image shows are sea surface temperatures only. At greater depths (say 300 m), warm water is pushed through the Greenland Sea by the Gulf Stream. Since the passage west of Svalbard is rather shallow, a lot of this warm water comes to the surface there. 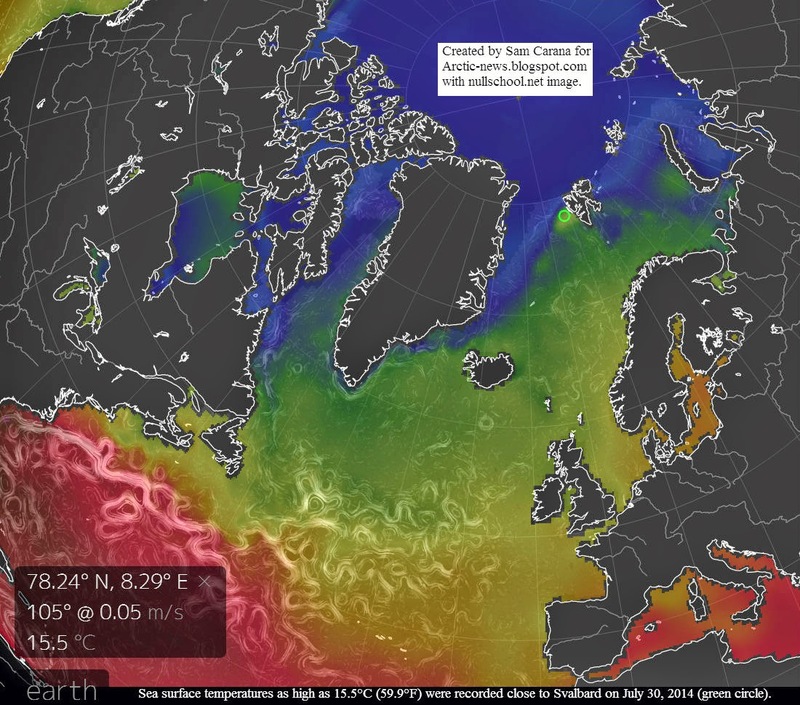 The high sea surface temperatures west of Svalbard thus indicate that the Gulf Stream is carrying very warm water (warmer than 15°C) at greater depths and is pushing this underneath the sea ice north of Svalbard. 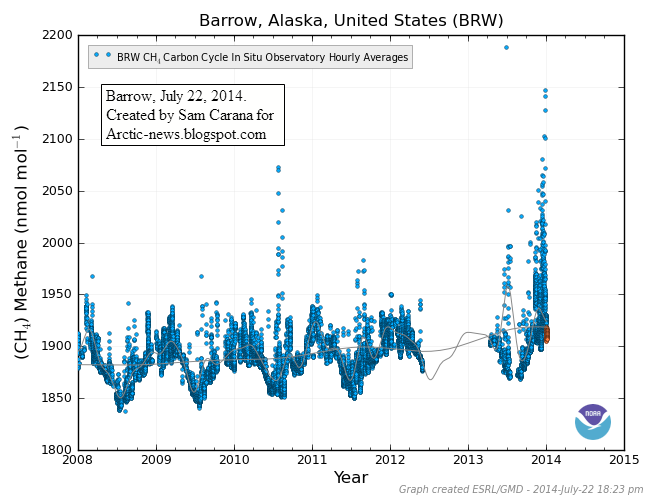 The evidence of abrupt high methane releases in the Arctic Ocean is accumulating. The graph below shows in situ methane measurements taken at the Barrow Observatory, including recent levels as high as close to 2200 parts per billion (ppb). Satellite data picture a similarly dire situation. 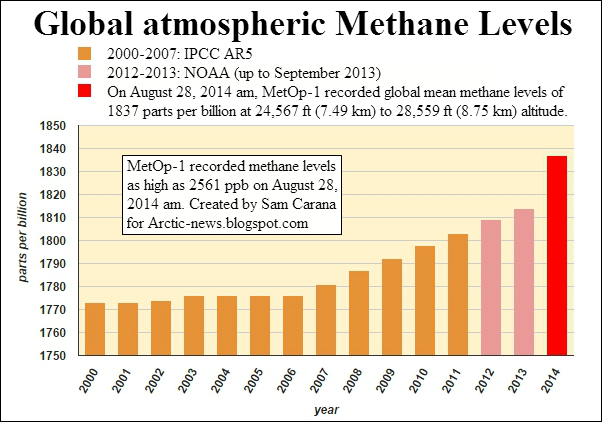 Global mean methane levels as high as 1831 ppb were recorded on the morning of July 30, 2014, while peak methane levels as high as 2330 ppb were recorded that morning. 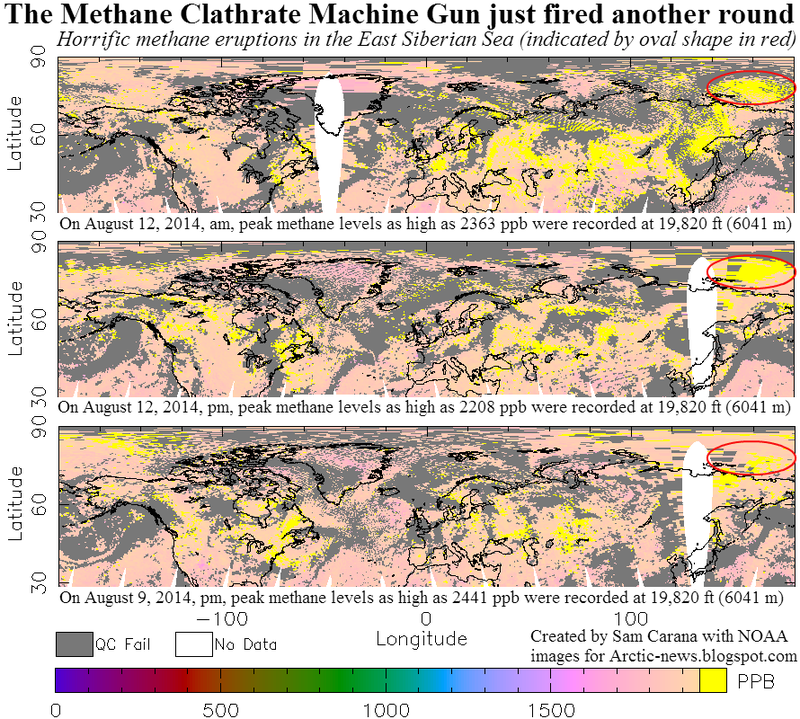 More recently, peak methane levels as high as 2522 ppb were recorded (on August 2, 2014). IPCC/NOAA figures suggest that methane levels were rising by some 5 to 6 ppb annually, reaching 1814 ppb in 2013. 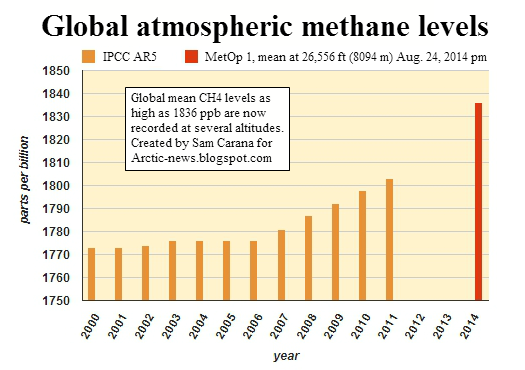 While methane levels at lower altitudes have indeed shown little rise, much larger rises have been recorded at higher altitudes, as illustrated by the image below. These high methane levels recorded at higher altitudes appear to be caused by the huge quantities of methane released from the seafloor of the Arctic Ocean during the period from end 2013 to early 2014. This methane has meanwhile risen to higher altitudes, while also descending to lower latitudes, wreaking havoc on weather patterns around latitude 60° North. The releases of methane from the seafloor of the Arctic Ocean were caused by water that had warmed up strongly off the east coast of North America from June 2013. It took some months for this warm water to be carried by the Gulf Stream into the Arctic Ocean. 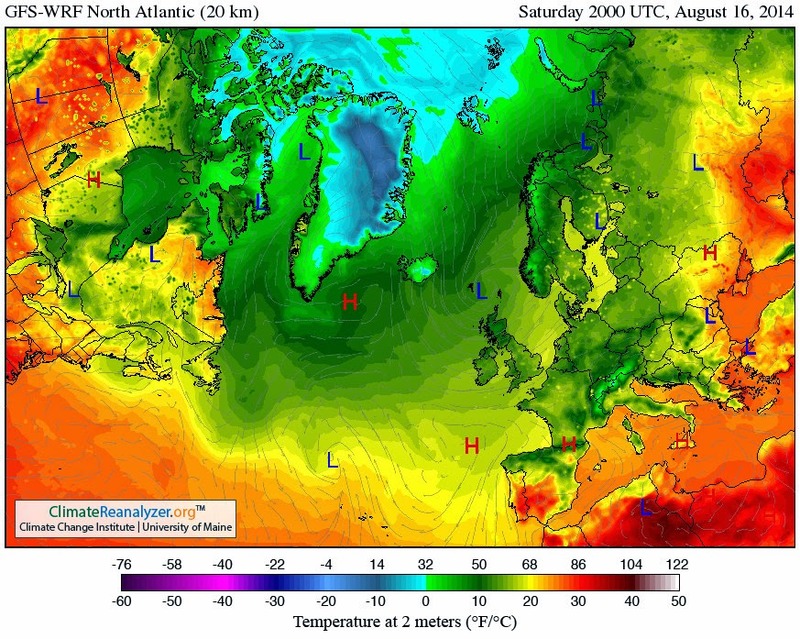 Meanwhile, very high sea surface temperatures are recorded in the Arctic Ocean, as above image shows, while warm water is carried into the Arctic Ocean by the Gulf Stream, as illustrated by the image below. 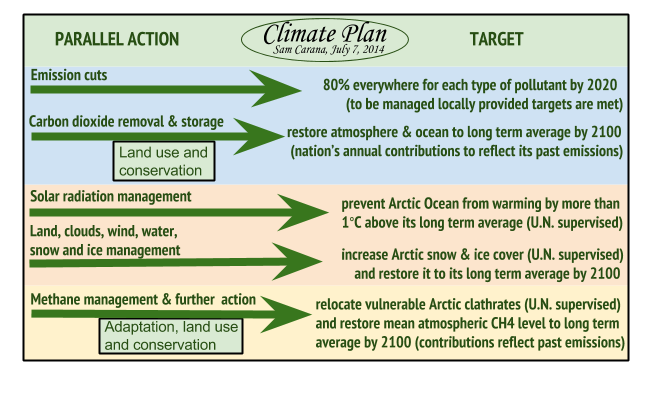 As said, the situation is dire and calls for comprehensive and effective action, as discussed at the Climate Plan blog.